Not red, but it is perfectly ripe. Do you know what this fruit is? It looks a bit apple like but it is in fact Quince. When I moved here 16 years ago my Mum bought me a Quince tree in honour of my Grandmother who had always had one and made beautiful Quince Jelly with it every year. It took a few years to really get going but now it produces a good crop each year and my Mother has taken over the job of being Jelly maker. We picked them all last weekend, they take longer than apples to ripen and not usually ready until towards the end of October. We then gave the try a bit of prune as it has got rather large. We shall have to wait and see how it reacts and if next year we get more fruit or if it takes year off to recover from its trim. How lovely to have a quince tree! I’ve never had Quince jelly before. 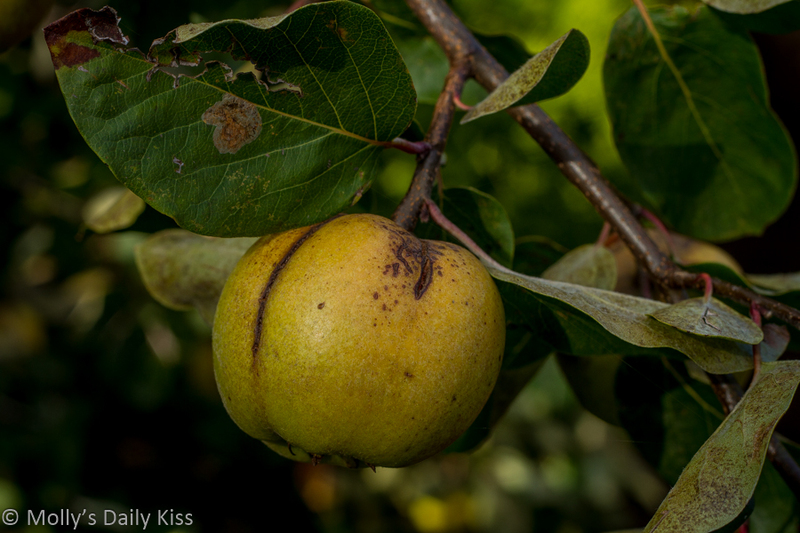 There is a vacant lot now that has a quince tree on it with ripe fruit but I wouldn’t know what to do with it.